A few months ago, I so happened to be at Georgetown University during a protest hosted by the Westboro Baptist Church. They had their hateful signs in tow, targeting LGBT people, Muslims, and anyone who does not subscribe to their hate club masquerading as a religion. What was remarkable to me was not the haters, but rather the student response. There were several counter-demonstrations. Some students were playing songs like “Let It Go,” and “Born This Way,” loudly to drown out the hateful chants and bullhorns. Others wore rainbow leis and stood out with their homemade signs bearing messages of tolerance and hope. Still others held hands silently with their backs to the demonstration, and there was an official unity rally with students speaking up for LGBT rights and more. 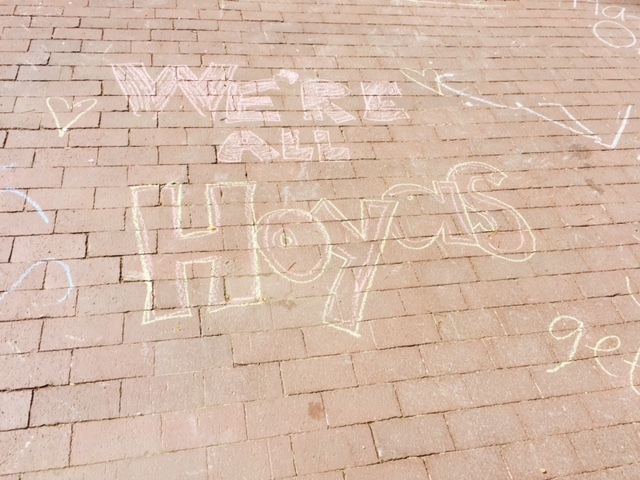 Some students chalked inclusion messages on the bricks, surrounded by hearts. I graduated from Georgetown in 2002. While there were people who were out, and there were people who supported LGBT rights, I know this counter-response would not have happened in my time. Three cheers to younger people leading the way with love and positivity today, and also to those (sometimes) deeply hated outcasts who came before them and demanded recognition when others were inclined to sneer, or look away if they were being charitable. All of it matters. We all can do something. We must never forget that we can change attitudes, and even dramatically. Yea, they came to Howard University with their message of hate, police lined the streets on campus where they were located expecting things to go crazy. However, so many students showed up in response and they chanted and sang so loud that you couldn’t hear any of the Westboro people. I was really proud of the student body… not a bit of violence… not even in their voices. It gives us hope in this battered old world. Thanks for sharing the story.